Students gathered in Umble Center for the annual “Theater Fling,” a GC Players event to kick off a new year of Goshen College theater on Tuesday, Aug. 28. The annual event is designed to reconnect returning students, give new students an introduction to the theater community and generate excitement about the upcoming year’s productions. 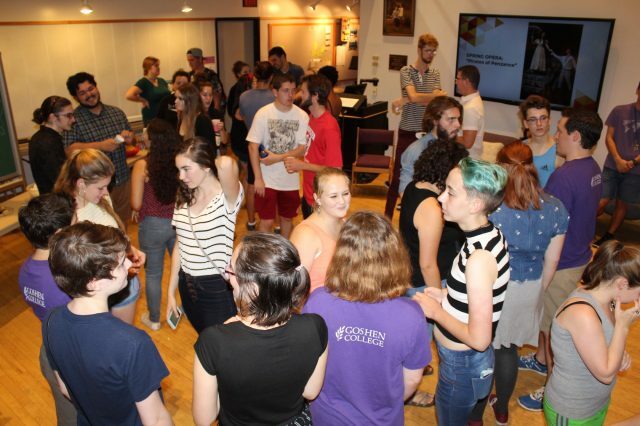 Upon arrival, students were able to snack and mingle, connecting and reconnecting with peers followed by a theater game designed to give students the chance to move around the room and interact more. The board of the GC Players, comprised of Jonah Yoder, Kelsey Winters, Rachel Buckley, Lauren Myers and Cristina Jantz introduced themselves and spoke about how the Players function as a whole. “[The board is] excited for this year and has some great new ideas in the works for events to share the love…we have for theater with the rest of the GC community,” said Yoder, a senior. Finally, the entire group moved into the auditorium where they were introduced to the theater department staff. Andrew Moeggenborg, technical director, introduced students who will be working as technical staff and gave instructions for students interested in what goes on behind the scenes. Doug Liechty Caskey, professor of theater, and Anna Kurtz Kuk, associate professor of theater, each spoke about the upcoming season celebrating Umble Center’s 40th anniversary and announced that this year’s department productions will feature the work of female playwrights and composers. The season will open with this year’s Peace Play, “History Lesson” by Frankie Little Hardin and directed by Ben Meyer Reimer, a senior film production, music and theater major. This show will run from Oct. 5-7. The fall mainstage, “Crimes of the Heart” by Beth Henley, will run Nov. 9-11 and 17-18. The spring mainstage, a musical, “Bright Star” by Steve Martin and Edie Brickell, will run March 15-17, 20 and 22. Student-directed One Acts will be performed April 12-14. Auditions for the Peace Play and the fall mainstage will be held on Sept. 5 and 7 at 7-9 p.m.